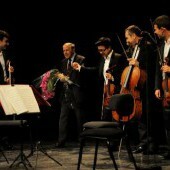 In 2012, ProQuartet was celebrating its 25th anniversary, organising 3 concerts at the Théâtre des Bouffes du Nord with masterpieces from Beethoven, Schoenberg and Boulez, performed by the Quatuor Diotima. Georges Zeisel : Do you perceive the Livre pour quatuor with the same distance that you did 10 years ago during our previous interview ? Pierre Boulez : This work was created out of my fascination for Alban Berg's Kammerkonzert. At first, I had a negative impression towards this composer and its romanticism. However, when I started studying the Kammerkonzert, I was grasped by the writing's formal richness, especially by the skill with which he superimposes the two first mouvements within the third one. The construction blew me away. I had never thought of him as an man with such a complex mind. I myself tried to struggle with this complexity. But Berg, he was aware of the issues. In the partitioning, he kept a few note organisations and textures to find one's way. On my side, I wanted to go further, so that one couldn't remember the first and second mouvements partitions if one was working on the 3rd and 6th mouvement. This is what I would like to do today : make the superimposition of these two mouvements audible. Georges Zeisel : In the years 1946-1947, did you have a new-found freedom as a result of Bartok and the three Viennese heritage ? Pierre Boulez : Of course ! But I turned down Schoenberg's neoclassical heritage. I claimed another part of heritage until his death in 1951. This year, I wrote an article "Schoenberg is dead", that shuddering all the Schoenberg fans. This title was perceived as an insult made to his dead body but that was not it at all. In this article, I say that we need to go further. It is pretty simple : Schoenberg is dead, long live Schoenberg. Georges Zeisel : When you wrote the Livre pour quatuor, did you feel a responsibility toward instrumental music in general ? Pierre Boulez : I particularly felt responsible for myself. I wanted to go as far as my ideas went. It was a bit like writing my Second Piano Sonata. I then had Beethoven as a model. Furthermore, as a pianist, I knew the instrument better than the string quartet. When writing the Livre pour quatuor, I was following Berg, a more complex model to follow. Georges Zeisel : Why did you immediately withdraw the Livre pour quatuor fourth mouvement ? Pierre Boulez : I had some other business to take care of : the Sinfonie Orchester Der Südwestfunks Baden-Baden has ordered Polyphonie X. That is why I dropped the quartet project. I should re-consider this quartet today, however it is a Sisyphean task. For the rock to stay up, I have to definitely define the situation. Now, what counts for me is sound and shape. Georges Zeisel : What is the nature of your work on the Livre pour quatuor ? Is it about re-writing or reviewing ? Pierre Boulez : It is a review. I wouldn't have the courage to rewrite. If I rewrote, I would have to do it entirely, and then it would be completely new piece of music. My work today is about texture, speed, dynamics. This is what I am interested in.